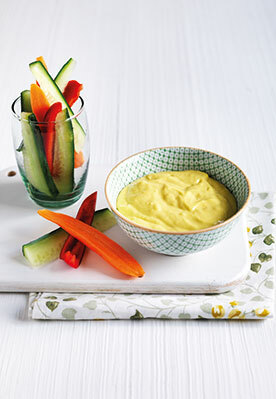 If you like garlic, this is the perfect dip for you – creamy and rich and perfect eaten with a selection of chopped vegetable crudités. 1. Place the saffron in a small bowl, pour over 1 tablespoon of boiling water and leave to stand. 2. Place the garlic, egg yolks, pepper and lemon juice into a blender or food processor and blend into a paste. 3. With the blender or food processor still running, slowly add the olive oil until you have the consistency you like. 4. Stir in the water and saffron and serve with chopped vegetables.